The Bananas v Krabi, Thajsko: Zarezervujte nyní! 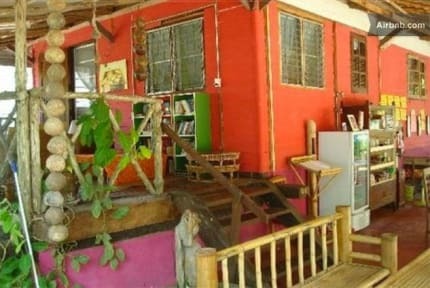 Bananas Bungalows is a secluded bungalow and guesthouse refuge and nature lovers paradise. Here you'll enjoy comfortable bungalow facilities on a budget. What our visitors love most about Banana Bungalows is the relaxed, familiar atmosphere and the beautiful natural mountain, mangrove and seaside surroundings. 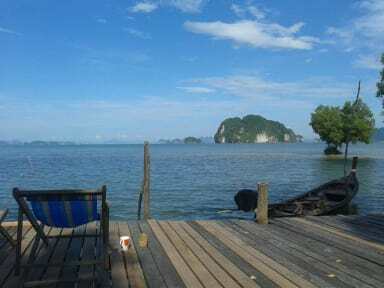 Located roughly 30 km from Krabi town in Ban Tha Lane (also spellt Ban Tha Len and Ao Tha Lane) we offer a refuge for independent minded travellers wanting to sidestep Krabi's mass tourism. Here at the base of the 'Golden Mountain' Khao Thong, in our quiet sanctuary from Thailand's tourist resort hustle and bustle, you'll enjoy the best of both worlds: the opportunity to totally unwind while simultaneously enjoying a wide variety of activities (this region is famous for as well as easy access to the nearby resort centers of Ao Nang and Krabi. Bananas Bungalows is the ideal place to relax with a book on the shady bungalow porch, laze in a hammock or deck chair on the pier, or be treated to superb Thai cuisine including fresh seafood, delicious curries, refreshing fruit shakes, vegetarian and vegan food all lovingly prepared in our restaurant by Bananas Bungalows wonderful local chef Tscha Dam.